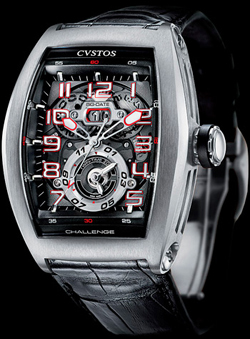 The famous Swiss watch company presents new Cvstos Challenge Twin-Time, has a body pillow in satin stainless steel. Housing length – 53.7 mm, width – 41 mm. Water Resistant – 100 meters. The dial gray Arabic numerals marked white with a red outline. The numbers and hands are covered with fluorescent material. In the “12 o’clock” is the date aperture, while the label “6:00” – display a second time zone. Closes dial sapphire crystal with anti-reflective coating. The back side of the case is also closed sapphire crystal, through which you can observe the work of the automatic mechanism Custos 551 Swiss production. Calibre collected at 21 stone, has a frequency of 28,800 vibrations per hour, 42-hour power reserve. New Challenge Twin-Time of Cvstos comes on a black leather strap with a folding clasp in stainless steel. Buy watches Challenge Twin-Time possible for 10,500 euros.